Business and Professional Women Geelong applies a professional and contemporary approach to delivering key professional and personal development opportunities for local women. At BPW Geelong, our aim is to empower and enhance the inherent strength of women by giving them the opportunity to build networks and develop key business and professional skills. Our events showcase powerful and inspirational speakers who deliver on a wide range of topics designed to build our members knowledge and power base. 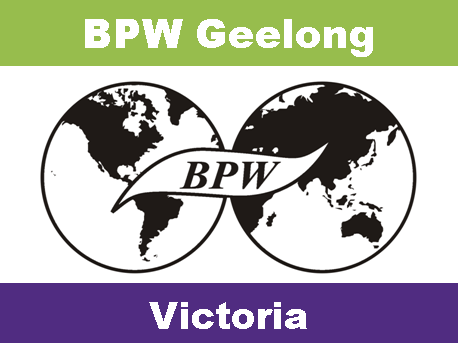 BPW Geelong was established in 1985 by our founding member, Micky Hayward, with the assistance of BPW Doutta Galla. Our vision is to empower the women of the Geelong region in all aspects of their life, including family, work, personal interests and wider communities. We offer our members and friends a great way to socialise and network at our monthly dinners and lunches. So if you are new to the region or just looking to expand your personal or professional connections we welcome you to join us at our next dinner or lunch event to enjoy the company of a friendly and dynamic group of professional women. Our Student Mentoring Program is one that is unique to our Club, but widely recognised through the broader BPW community and is something all of our members should be very proud of. BPW Geelong prides itself on delivering quality events for our members and guests, and it is my goal to continue to work with my fellow Board to provide events that engage, inspire and help us all to be the best possible version of ourselves; to create an environment where we can feel safe and supported as we learn and develop and to play our part in championing the rights of women throughout the world. At BPW Geelong we welcome all new members and guests into our BPW community. Business & Professional Women (BPW) Geelong is a not-for-profit organisation, which is affiliated with BPW Australia and BPW International. BPW Geelong works to improve the position of women in the workplace, on boards and in leadership by providing opportunities to network, develop personal and professional skills, and become involved with projects that support this mission within the Geelong community and beyond. Business and Professional Women Geelong facilitates women's professional and personal growth and development by providing them with opportunities and support networks. BPW Geelong hosts monthly events for women of all ages. Our monthly events showcase powerful and inspirational speakers who deliver on a wide range of topics. Email bpwgeelong@gmail.com to go onto our database to stay updated about our events. Since 1999, BPW Geelong has run the ‘Making a Difference’ Mentoring Program, working with Year 11 and 12 girls from secondary schools primarily in the northern suburbs of Geelong. More than 60 girls have graduated from the program in this time. The program runs over two years, commencing at the beginning of Year 11 and concluding at the end of their Year 12 studies. BPW Geelong appoints two Mentoring Directors to oversee the program – one for the Year 11 program and one for the Year 12 program. This allows the girls to learn from, and establish strong relationships with two different professional women throughout their program. The Mentoring Directors have monthly catch-ups with their mentees where the cover topics including confidence, fear, mindset, success, time management, networking, public speaking, health, success and goal setting. The mentees also attend BPW Geelong’s monthly networking events where they can put their skills into practice in a safe and welcoming environment. Attending the networking events also allows the girls to begin building relationships with local professional women and creating valuable networks. Upon completion of the program in Year 12, the girls are taken shopping for a business outfit that they can wear to interviews, work and networking events, and are treated to a day of pampering where they have their hair and makeup done and participate in a professional photoshoot. At their graduation (held in February after they complete their schooling), they are presented with a framed photo from their photoshoot, a certificate of completion from the program and speak about their experiences.